By K Takeuchi et al. (Fujinaga Pharm Research Division) published in the Journal of Pharmacological Sciences, 95(4) : 149-157, 1990. Tar agents include coal tar, wood tar and ichthammol ointments. Coal tar and ichthammol ointments are popular as cheap over the counter drugs available without prescription. Medicines, having been applied since long time ago, with known effects and reasonable prices are rarely chosen as a subject of medical or pharmaceutical study. The paper introduced here was submitted by Hujinaga’s research division around that time. Maybe they wanted dermatologists to review the advantages of tar by pharmacologically verifying its effects. Being written in Japanese, this paper provides precious data, for there are few that cover pharmacological action of topical tar drugs. Production of most topical tar drugs has been discontinued in Japan. Maybe they are too cheap to gain profit. 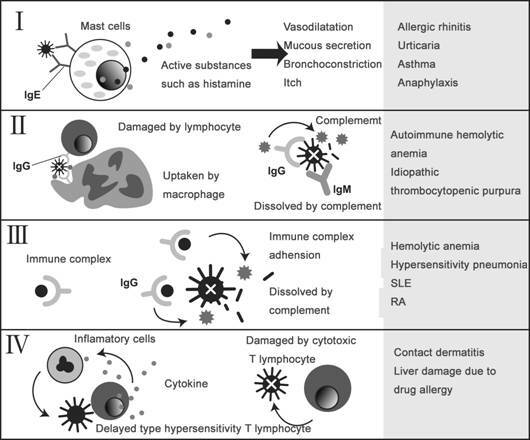 The paper compares the effects of glyteer, non-steroidal anti-inflammation agent and steroid agent for each experimental system according to Coombs and Gell allergy type classifications (I to IV). The allergy can be classified into the following 4 types. Type I is an immediate reaction type, Type II is an antibody-dependent hypersensitivity, Type III is a reaction caused by an immune complex of antigen and antibody, and Type IV is a delayed hypersensitivity (cell-mediated immune memory response). Mice were used for each experimental system. As to type I, after intradermally injecting rat anti-ovalbumin serum (including immediate type anti-albumen IgE antibodies) into the mouse’s back, ovalbumin mixed with pigment (Evans Blue) was intravascularly injected. Measurement of Evans Blue contents in a given amount of cut off skin gets higher, as the immediate reaction becomes stronger and more pigment is leaked into the blood vessel. Effects on Type I depends on how much this pigment leakage can be contained by topically applied glyteer. Bufexamac and indomethacin are both non-steroidal anti-inflammation drugs (NSAID) and betamethasone 17-valerate is a steroid ointment. For Type I, glyteer and steroid are effective, whereas NSAIDs are ineffective. 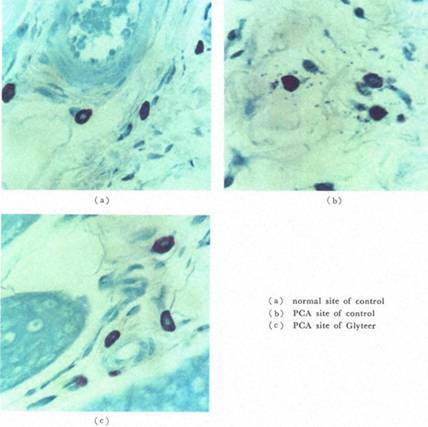 Shown above are pictures of murine skin tissue. Picture (a) is the image of a control specimen. Picture (b) shows Type I response where degranulated mast cells are releasing histamine. In Picture (c), degranulation is constrained because glyteer was topically applied in advance. As to Type II, glyteer is ineffective and steroid and NSAIDs are effective. As to Type IV, all were effective in the order of steroid, glyteer and NSAIDs. To summarize, glyteer was effective for Types I and IV, while NSAIDs were effective for Types II and IV. As far as Type IV is concerned, glyteer was more effective than NSAIDs. Steroid was effective for all types. If I had seen these results in 1990, I should have had no interest and just thought, “Steroid is the most effective after all.”But I have different impression now that I know about addiction and rebound induced by long-term application of steroids. I’m pleased to know that glyteer is effective for Types I and IV, even though it is inferior to steroid. Actually, many doctors employ tar drugs in supporting steroid withdrawal. Many doctors may wonder what they should use instead of steroids. Why not switching to new drugs such as Protopic (Tacrolimus) ointment or employing tar agents whose effectiveness and safety have been proved throughout the long history of its use. Of course, there is a way to administer nothing if patients so desire, just keep an eye on them and support only when infectious disease or complications should develop. This is also a reliable medical practice for patients. What is required of doctors is not limited to prescribing drugs. I’d like to say to dermatologists who have never treated patients addressing steroid withdrawal, “Why don’t you tell patients trying to stop all topical steroids without any drugs that you will administer no drugs, just monitor their conditions once a month and support them till they recover. Then you’ll become a reliable doctor for patients for the first time, not just a pharmacy.